Around this time of year, people are itching to know when would be the best time to visit a nearby park etc. to see beautiful cherry blossom. 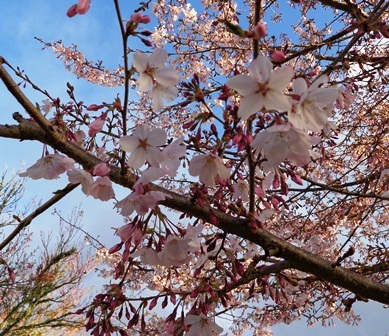 For this purpose, all sorts of organizations put ‘cherry blossom forecast’ out each year. You can have a look at those forecasts on the Internet; for example, here (the site of the Japan Times). Now cherry blossoms are beginning to bloom in Kyoto. Although we can see beautiful cherry blossom here, in New Zealand, in September, the news of Japanese blossom in March/April always makes me feel jealous!